One small 40-watt lamp in the corner illuminated the broom-closet sized room I was working in. The intense energy of the interrogation lamp was met by the whirring of the camera and the cold blue light from the computer screen. I opened the small box holding two month’s work in it – a set of slides with mouse brain sections mounted on each one. Looking through the box, I selected one of the slides I had not yet looked at, gently wiped it off, and placed it on the microscope stage. I was especially excited to look at this slide – let me explain why. 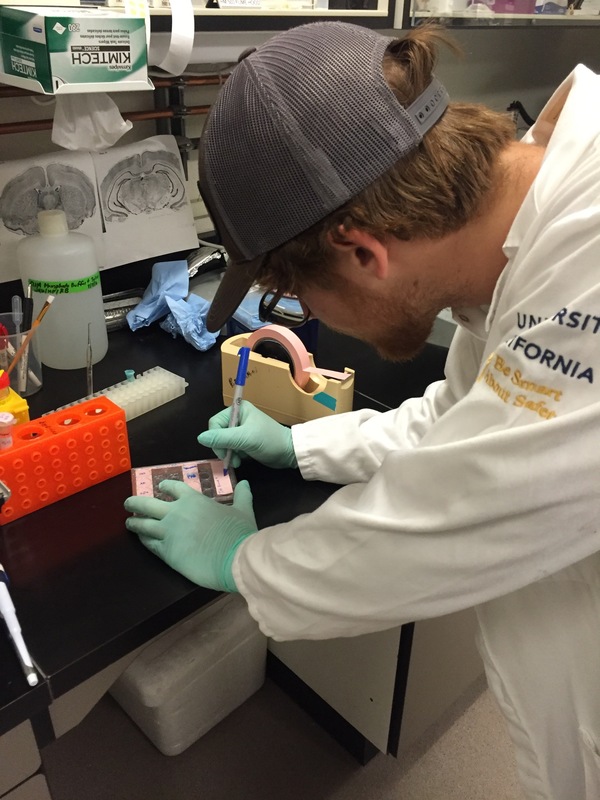 I am working in a lab at University California Davis this summer, in the Department of Neurosurgery. I worked here last summer as well. We are studying a late-onset neurodegenerative disorder called Fragile-X Tremor/Ataxia Syndrome, or FXTAS. 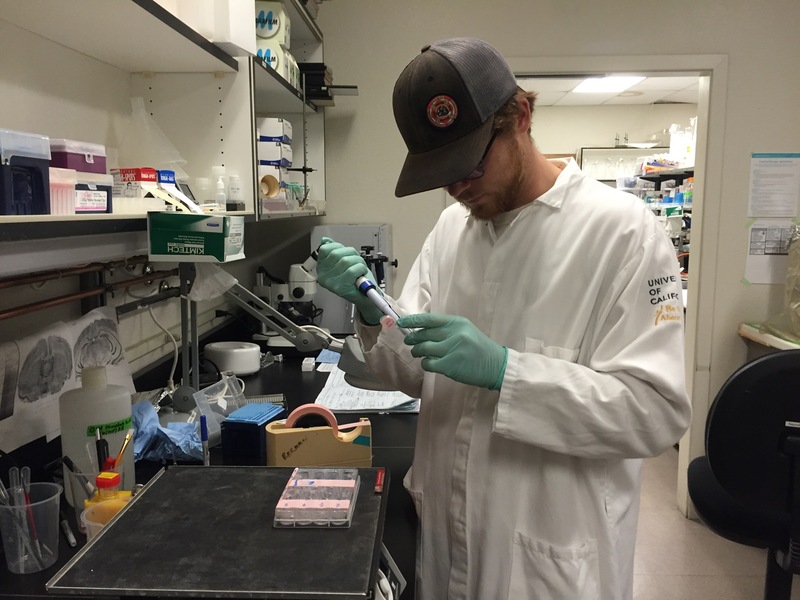 We work with an inducible transgenic model of the animal that mirrors human behavioral and neuroanatomical pathology, allowing us to study how the disease functions, so that hopefully one day a therapy might be developed to treat it. Because the animal model is not exactly identical to the human model, we need also to study how the disease manifests in the mice. This summer, my work focuses on demonstrating that brain tissue from the mouse model shows the hallmark pathology of FXTAS: ubiquitin positive intra-nuclear inclusions. Inclusions are aggregates of non-functioning proteins. Ubiquitin-positive means that the inclusions bodies show up in the tissue when we use a stain that targets ubiquitin, which is a small protein that tells the cell when and what molecules need to be degraded by cellular recyclers. The inclusions are present as dense clusters within the nucleus of cells, thus they are intra-nuclear. We are uncertain whether or not these inclusions actually damage the cell, or if they protect the cell from malformed toxic protein products. Regardless, across the board, organisms afflicted with FXTAS have them. Which brings me back to the dark room with the fluorescent microscope and the eerily whirring camera. So far the tissue I had worked with had stained positive for ubiquitin, but under a high-power flourescent microscope we could not find anything that was overwhelmingly convincing of inclusion bodies, which should show up as a dense glowing red cluster next to a translucent blue nucleus. Three days prior, I thought it might be a good idea to check the expression of the malignant gene in the tissue, which we can do by looking at the tissue under a different wavelength of UV light. Despite being labeled and genotyped as a FXTAS animal, the brain showed minimal expression of the gene at best, if any expression at all. This provided a potential explanation to the poor ubiquitin signal I had been getting – perhaps there was minimal development of the disease in this animal, perhaps it did not receive enough of the dietary supplement that activates the gene… regardless, expression was not strong in the tissue I had been looking at. The slide I pulled from the box was stained the same as the previous tissue, but from a completely different animal– one that should also have strong expression of the FXTAS transgene, and therefore should have many cells punctuated by bright red inclusions when beamed with 568nm ultraviolet light. I placed the slide on the microscope stage, and flipped open the filter, illuminating it with blue UV light. Before me on the computer monitor was portrayed a cross section of a mouse brain. Luminescent blue nuclei betrayed the highly organized arrangement of the brain. Familiar structures emerged from the background; characteristic curves and varying cell densities divide the brain up into regions with specific functions. I used a joystick to move the objective over a region we are particularly interested in, and is known to express inclusions: the hippocampus. I closed the filter and replaced it with the red one. I suppressed any expectation – excitement and disappointment go hand in hand during scientific exploration, and I knew there were best case scenarios and worst case ones too. No matter, all I could do was open the filter and see what there was to see. I flipped it open. Today, I suppressed a shiver as I was capturing more images of the inclusions. Yes – my staining worked in the new set of tissue, and in the rest of the tissue I have stained so far. I am ecstatic about this breakthrough, conducting this research has required a lot of patience and a lot of big picture thinking to stay motivated through the sometimes tedious lab work. Yet despite my joy of success and the thrill of discovery, for a moment today I sat in my chair staring at a hundred angry red eyes, each glowing insidiously from inside the blue skeleton of a neuron, direct evidence of disease undermining such a brilliant system as the vertebrate brain – an organ so powerful it manages to synthesize in a moment a reality that can be conceptualized by us, then break that gestalt reality back down into bits and pieces of language, allowing us to connect across generations and distances; it is an organ that allows elephants to speak across vast distances at low frequencies, and remember thousands of miles of directions to critical watering holes and safe locations, to feel empathy; an organ that allows ravens to reason and chameleons to calculate the trajectory of an insect and intercept it with its tongue. In that moment, in that shiver (a visceral nervous response generated somewhere in my brain or spinal cord), I think I was finally struck by the implications of my work – I felt an aversion to those angry red eyes, a realization that this disease is a reality for some people. If I had any doubts about studying neuroscience for the rest of my life, they were surely shed with that shiver.